Vatican City (Agenzia Fides) - Cardinal Fernando Filoni, Prefect of the Congregation for the Evangelization of Peoples, together with Secretary, Archbishop Protase Rugambwa, and Adjunct Secretary and President of the Pontifical Mission Societies, His Exc. Giovanni Pietro Dal Toso, and Undersecretary Fr. Ryszard Szmydki, struck by the sudden death of the Archbishop of Hochiminh-ville, His Exc. Msgr. 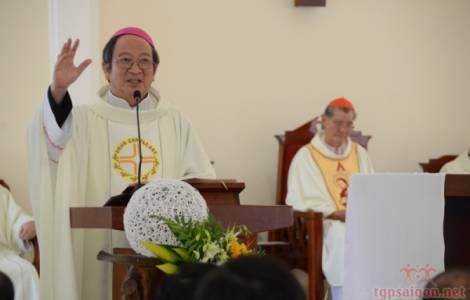 Paul Bui Van Doc, in Rome last night, express their sincere condolences to the Archbishop's family, to the entire Archdiocese of Hochiminh-ville and to the Vietnamese Episcopal Conference. The entire Missionary Dicastery and International Secretariats of the Pontifical Mission Societies join in prayer for the eternal rest of the soul of this wise and zealous Pastor and pray for those who are now in pain. Msgr. Paul Bui Van Doc was in Rome together with other Vietnamese Bishops, for the Ad Limina Apostolorum visit in the Vatican, from 2 to 11 March. On March 5, the Bishops, including Msgr. Van Doc, had been received in audience by Pope Francis. Msgr. Paul Bui Van Doc suffered a stroke yesterday during a concelebration in the Basilica of Saint Paul outside the walls. He was urgently admitted to San Camillo hospital and died at 10.15 pm on 6 March.